Height: 19-24 inches (48-61 cm). Weight: 60-90 pounds (27-41 kg). 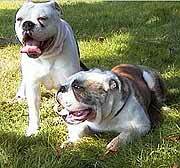 Dorset olde tyme bulldogges should possess a stocky, strong muscled physique - height and weight should be in keeping with a symmetrical, well-proportioned body, keeping the appearance of strong traditional bulldogge looks. 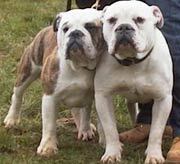 The Dorset olde tyme bulldogge's shoulders are muscular and slightly sloping; forelegs straight, well boned and set well apart; elbows turned neither in or out; feet broad strong, toes tight, nails curved and strong, pads thick and tough. The hindquarters are broad and muscular, with well-developed second thigh denoting power, but not cumbersome; moderate angulations at hocks. The gait is powerful, heavy, with good drive from the hindquarters. A straight or pump-handle tail is preferred and most desired, but crank and cork screw are accepted. The head is large, the upper region slightly convex from one side to the other; the forehead dominates the face. However it is still wider than high. The head is furrowed, with loose thick and wrinkled skin about the throat and side of head. Cheeks are prominent due to the strong development of the muscles. There is a broad, short, deep and strong muzzle with obvious folds, keeping its length in comparison with that of the entire head. The nose is broad, with well-open nostrils. The ears are set high and wide. Rose preferred though button accepted. The body is compact, the chest wide and deep with ribs well sprung and well set down between the forelegs. The back is short, giving the impression of a well-balanced dog. The neck is slightly arched, of moderate length, very muscular and almost equal to the circumference to the skull. The top line is solid with a broad and muscular back, withers well-marked, broad loin, rather short and solid. 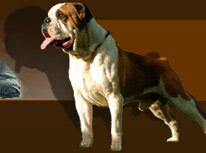 The coat is of fine texture; smooth, flat, short coat desired, similar to the glossy sheen of the Stafford. 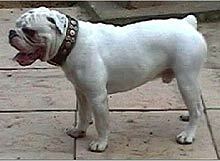 Dorsets are bred in variations of white, brindle, also black and slate grey-blue, the slate gray blue's known as Dorset Blue poole's, as a respect and tribute to the original blue Paul (pol) of Scotland, and the area of Poole in Dorset. Explores the many ways in which dogs historically and currently serve humankind in the workplace, while encouraging sensitivity to the needs of working dog breeds kept as pets. For beginners and experts alike in the fields of tracking, obedience and man-work.